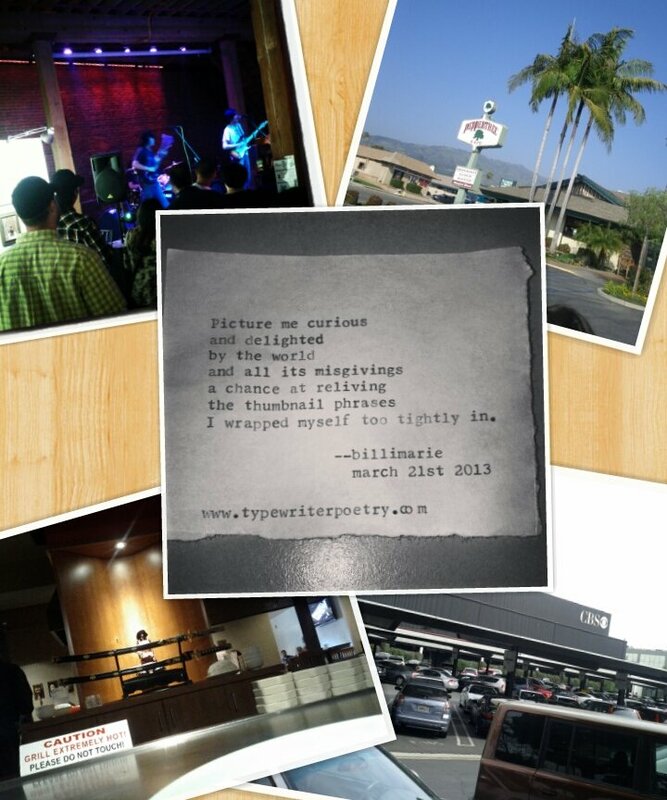 Thanks to everyone who stopped by Typewriter Poetry at the Venice Art Crawl last week. I had an awesome time meeting you all and typing a bunch of poems. Blame all misspellings and obtuse rhymes on the free nachos and cups of wine! Here’s a poem my friend Jimmy requested; the subject was “poet’s choice” so I was inspired by photography, Jimmy’s passion. I wrapped myself too tightly in. rhyme. I like your poem “picture me curious” because I see it as a line of conversation between two people in love. This is lovely! You’ve nailed photography beautifully! I love your collage and the poem. Billiemarie, this is a perfect poem. Is this the web site you are using now to post your poems? I like to say a hello to thenail thumb phrases you have too tightly wrapped up yourself in…. !